MANILA, Philippines - Hot Shooting Hotshots steal a win from Aces. After the Meralco – NLEX face-off during the first game of the thriller Friday, Purefoods and Alaska played their own best-of-three series. Alaska Aces now on the verge of elimination after a 120-86 loss against Purefoods Hotshots on Friday, March 27 at Smart Araneta Coliseum in Cubao, Quezon City. Coach Tim Cone played his 11th straight playoff game with Purefoods – San Miguel Franchise and faced Alaska for the 16th time in his entire coaching career and ironically against his student and protégé Coach Alex Compton. Purefoods really lived by their moniker: Hotshots, looked to get away with the Aces early in the first quarter. Forward Joe Devance and Shooting Guard Peter June Simon rained threes while their import, 6’10” Center Denzel Bowls shot 3 for3 with more than 9 minutes remaining in the opening act. Cyrus “Skyrus” Baguio placed the Aces on the score board with his jumper and his only 2 points after a 14-1 run by the Hotshots. Calvin “The Beast” Abueva who came from a controversial verbal altercation with Talk ‘N Text Tropang Texters prolific import Ivan Johnson last Sunday came off the bench in a very rare occasion. Abueva struggled from the very start with 0 for 7 shooting. Bad luck continued to shadow Abueva until he sprained his ankle and went out of the court limping and begging coach Compton to replace him. The Hotshots ended the first quarter with a humongous 31-7 lead. Come second period, Alaska Aces import Damien James and RJ Jazul capitalized on Denzel Bowles’ 3rd personal fouls and finally found their rhythm on the floor chipping in 13 and 6 points respectively to ramp up their score 44-27 still in favor of Purefoods with 3 minutes remaining before the half time break. Crowd favorite, “Big Game” James Yap joined the scoring party with his own version of mid-range jumpers and a rainbow shot before heading out to the dugout with a very comfortable 25-point lead, 54-29. 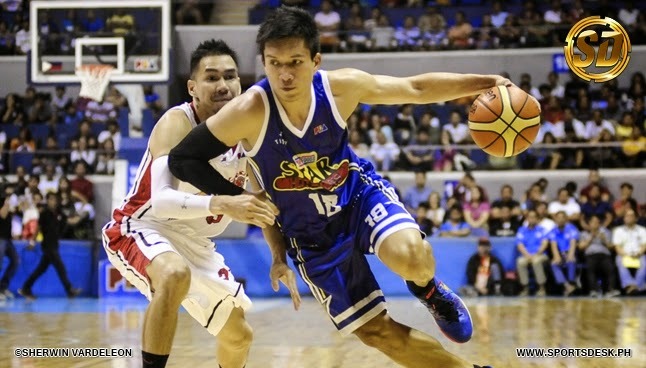 James Yap bagged the Best Player of the Game with 18 points. Abueva re-entered on the third quarter after re-taping and shrugging off his sprained ankle and his poor performance in the first half. “The Beast” made his first two baskets in the ball game after 3 minutes of the third. Playing with his third personal foul in the game, Denzel Bowls still dominated the shaded lane and created difficult angles for the Aces’ top scorers to maintain their thirty plus point lead in the third quarter. Entering into the final period, five players from Purefoods were already in double figures against to one player from Alaska, their import, Damien James with 21 points followed by RJ Jazul with only 9. Coach Alex Compton who was also involved in a verbal tussle against Ivan Johnson of Talk ‘N Text waived the white flag early in the final quarter by resting his import and Calvin Abueva and let Sam Eman guard their goal against Denzel Bowles who had 20 points and Rafi Reavis who posterized the Alaska second-stringer Center with a two-handed gorilla dunk. Multi Titled Coach Tim Cone and his boys reached their 100-point mark half-way in the fourth quarter, 101-71. With solid 30-point lead, Coach Cone pulled-out his starters and gave Don Allado, Justin Melton, Lester Alvarez, Mick Pennesi and Allain Maliksi the opportunity to take care of their big lead and a chance to impress him in exchange of more playing time in their future games. The crowd went “gaga” when Jerwin Gaco entered the floor for the very first time. Everyone went wild when Purefoods’ “lucky charm” Gaco scored his first four points with 2 for 2 or 100% shooting along with one rebound and one assist against his one and only personal foul. With this win, Coach Tim Cone is still capable of retaining his 2014 Commissioner’s Cup trophy and like Meralco who won earlier is just a win away towards the semis.